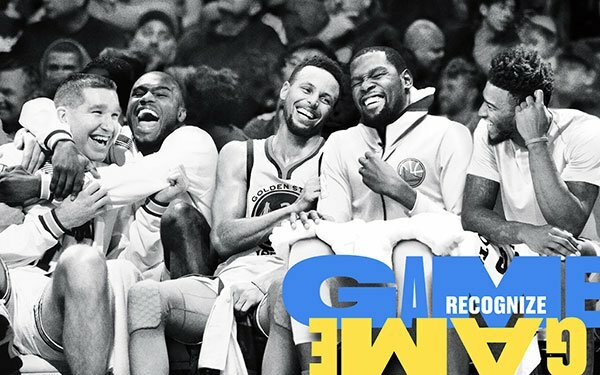 The Golden State Warriors of the National Basketball Association are celebrating their final year playing at Oracle Arena in Oakland, CA by recognizing their 47-year legacy. The "Game Recognize Game" creative, developed with ad agency Duncan Channon, intermixes images of the team’s past basketball history with current players. The tagline also winks at local fans who recognize the 1993 Bay Area rap anthem of the same name. TV spots show past legends like Rick Barry and Baron Davis alongside current stars like Steph Curry and Kevin Durant. The Warriors’ long-time TV analyst Jim Barnett commentates. Still, the technical mixing of the past with the present wasn't an easy execution, says Channon. "With most campaigns, you concept an idea and go shoot exactly what you want," he says. "This is much more like a puzzle where you’re always looking for that missing piece, that player from 1978 who happens to be in exactly the right place to receive a pass from a player in 2018." Channon adds that blending today’s high definition footage with yesteryear’s standard definition was no joke either. Hopefully, "the end result looks effortless, but, rest assured, there was plenty of effort," he says. The media strategy uses out-of-home to reach diverse fans across the Bay Area, not just those who regularly interact with the Warriors’ owned channels of TV, digital, social and Oracle Arena itself, says Channon. "We specifically chose digital out-of-home to allow the greatest flexibility to rotate between a dozen creative executions to continually delight fans over the course of the season."